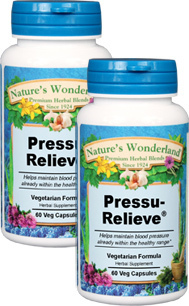 Pressu Relieve®- 500 mg, 60 Veg Capsules each (Nature's Wonderland) - Penn Herb Co. Ltd.
Support healthy cardiovascular function and support blood pressure already within the healthy range. This targeted blend now includes Motherwort, historically used to soothe stress and support the nervous system, especially related to a healthy heart. Hawthorn Berries… the popular herbal heart helper supports healthy blood flow and cardiac muscle tone. Black Cohosh…supports blood pressure wellness, circulatory health AND provides calming nervous system support. Golden Rod, Sarsaparilla… supportive herbs help maintain proper fluid balance. Supports blood pressure already within normal range; supports healthy cardiovascular function; supports nervous system health.